While our recent wild weather whipped away lots of leaves and damaged a great many flowers, undaunted trees along our creek are really beginning to color up for fall. Despite the weather, in the garden I still have bubblegum pink blooms covering my fall-blooming Camellia sasanqua, mounds of marginally tattered chrysanthemum ‘Sheffield Pink’, and aster ‘Raydon’s Favorite’ (Symphyotrichum oblongifolius) in bloom. Plus, sprinkled throughout are flowering salvias, roses, calamint (Calamintha nepeta nepeta), and a lone pale pink balloon flower (Platycodon grandiflorus). I swear next year I need to add some of the fall blooming bulbs to add to the show! Above: Tupelo and holly on the creek. 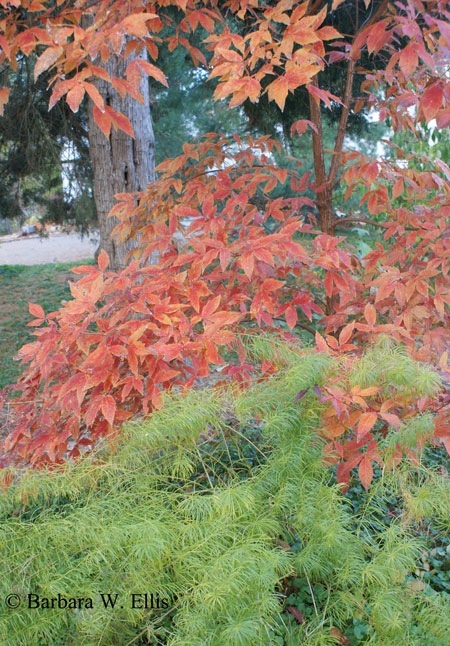 Outstanding fall foliage is high on my list when considering trees and shrubs to plant. Tupelos (Nyssa sylvatica) probably top my list here. The one I planted on the bank along the roadside this fall won’t rival the ones growing along the creek during my lifetime, but I’m still happy that it’s there. I’ll get my share of enjoyment from it, and with any luck it will be here for the next person to own this place. I’ve also managed to transplant a couple of oak seedlings that showed outstanding fall color—I think both are black oak hybrids (Quercus velutina). They seem to have established themselves as well. 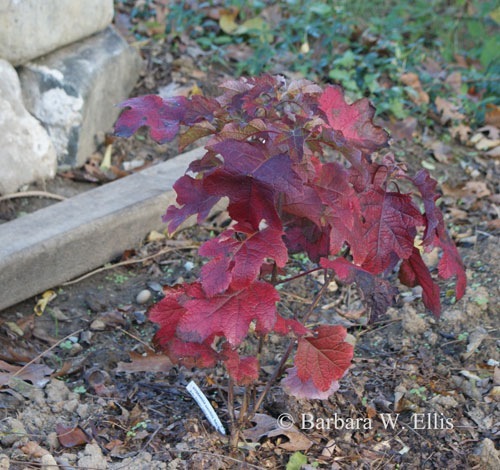 Oh, and then there’s my little, newly planted ‘Ruby Slippers’ oakleaf hydrangea (Hydrangea quercifolia). Now there’s some great fall color! Above: Oakleaf hydrangea ‘Ruby Slippers’ has maintained scarlet foliage since October. Today, though, I wanted to highlight a fall favorite of mine that is sort of accidently sited in the garden: Three-flower maple (Acer triflorum). My plant came from my Pennsylvania garden, where I had tortured it in a pot for a few years while dithering about where to plant it. Here at Hackberry Point, I popped it into in a holding bed with the intention of eventually moving it to a permanent location. Add seven years to that intention, and its holding bed location has become permanent. Fortunately it seems to be well sited. Red cedars (Juniperus virginiana) behind where the holding bed originally was located form a nice dark backdrop and set off the glowing fall foliage beautifully. The plant is simply stunning this time of year. Above: Three-flower maple (Acer triflorum) with Amsonia hubrectii. A small, fairly slow-growing tree, from 20 to30 feet at maturity, three-flower maple features three part (trifoliate) leaves that are dark green for most of the summer. 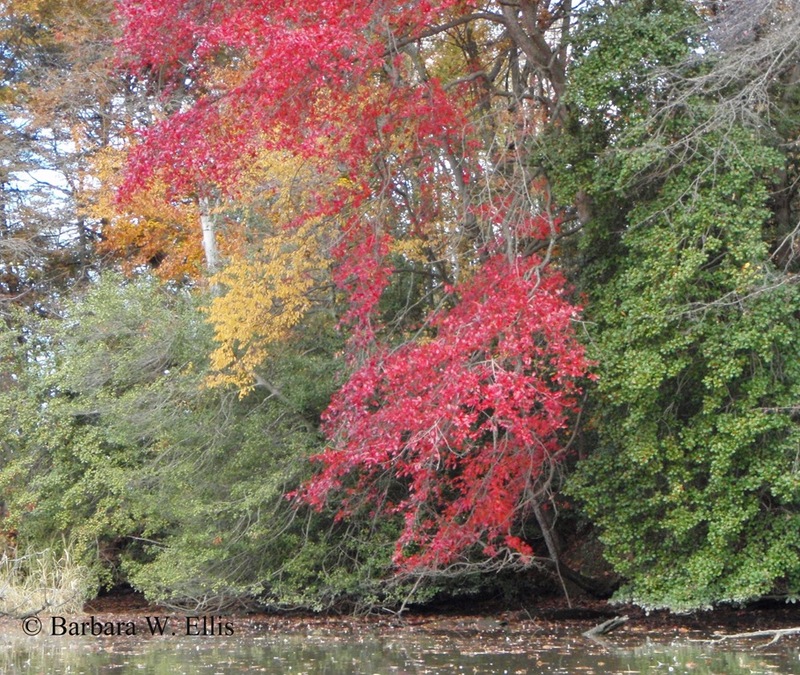 Fall foliage includes reds, oranges, and yellow. (Here, my photographs express the color better than words.) Woody plant expert Michael Dirr also says the bark is outstanding, although I have to admit I’ve never really looked at it. 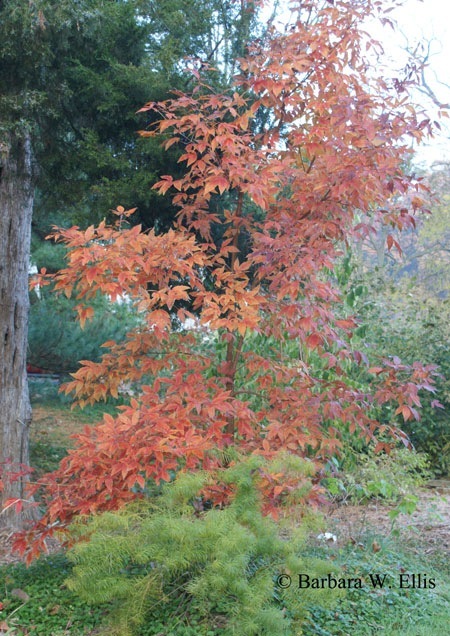 This is a great small specimen tree or a nice addition to a shrub border. Hardy in Zones 5 to 7, it is native to Manchuria and Korea. Mine is growing along the driveway in an area that is becoming a mixed border. At any rate, I’m sure this isn’t the last time I’ll write about this lovely small tree. I should also say that my plant has thrived happily without being watered since I popped the plant into a temporary holding bed back in 2004. That’s another reason to recommend it!